We put our fingers on the pulse of IT decision makers as they identify their issues related to cloud computing, the challenges posed by mobile device growth, and identify best of class behaviour. 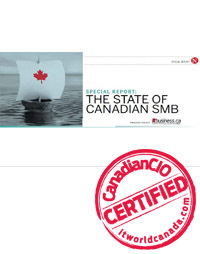 What are Canadian businesses planning to spend their IT budget on this year? Will that budget be greater or lesser than previous years? What technologies do they view as critical to growing their business? These are the types of questions we put to our nation-wide audience of small to mid-sized businesses in our State of the SMB research exercise.